Let us hope that this is just the first of Melanie Rutten’s books to be translated into English, because I want to be able to appreciate absolutely everything she creates. 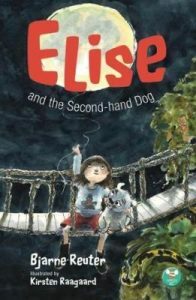 This book – broadly about growing in confidence and becoming independent, but about much else along the way – has that surreal, quirky individuality which I thrill at discovering in a picture book. The book’s cast – a rabbit, a stag, a soldier, a cat, a book and a shadow – are each given their own ‘chapters’ as the story unfolds whilst Rutten’s watercolour illustrations complement the narrative seamlessly. She uses lots of smaller illustrations as well as pagespreads and the book has been sumptuously designed and printed on thick paper by the New Zealand publisher, Book Island. One to make a point of asking to look at whenever you are in a bookshop – and if the shop isn’t stocking it you should tell them that they absolutely must!